Hen Parties in London are our favourites!! If you’re in charge of planning a hen party in London you’ll likely be facing the challenge of coming up with a unique party idea that’s a little bit different! This is where we can help. 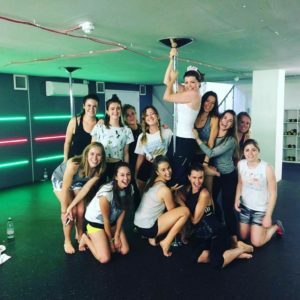 The range of options available for hen parties can be quite overwhelming, so we’ve created our classes to be just the right length of time with the perfect amount of pole dancing, laughs and hen-party fun. Our classes are the perfect gift for any party whether it be full of gym lovers, exercise fanatics or just a group of ladies looking for a bit of fun and movement before heading out on the town. Our main venue for pole dance classes is at TrainFitness Southwark. This venue has mirrors, a great sound system and ambient lighting making it a great venue to pole dance on your hen party. Fit4Less Southwark – £250 for up to 10 people. £15 per additional person. Hen Parties take place on Friday evenings, Saturday or Sunday. All our hen parties are held at our main venue in Southwark.